Get ready for a night of readings about Los Angeles at City Listening II. Design East of La Brea, a.k.a. de LaB, is throwing its first ever fundraiser on Saturday, June 26, and you’re invited. 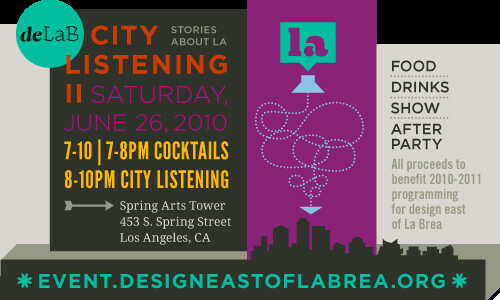 A redux of 2008’s City Listening, City Listening II will feature local design writers (including AN‘s very own Sam Lubell) reading selected stories about Los Angeles. There will also be a silent auction of art work by de LaB members, food, drinks, and special guests. To put the cherry on top, the event is being hosted at downtown LA’s beautiful Spring Arts Tower. Tickets are on sale now (here) and if you purchase yours by tomorrow you’ll get a discount!